Practical guidebooks for the more adventurous traveller. Leaving Europe on a Saturday morning and back Sunday night (sixteen days), you could spend up to nine days in Morocco including nearly a week on the piste. Although a mad rush, this would be enough time to do most of the Hamada du Draa pistes. Alternatively you could take it easy by hiring a Mitsubishi in Marrakesh or Agadir (about £600/ €900 a week) and, as long as you're aware of the limitations of an unequipped and unprepared vehicle, cover the same ground. Cross from Central Europe to Tunis for a more leisurely exploration of Tunisia. Fly in for a ten-day 4WD- or camel-based tour of just about any corner of the Sahara you choose with a European-based operator. Join a 4-day local 4WD tour of Tunisia's Chott region as part of a Tunisian package holiday in Djerba. it's not exactly Sahara Overland but they'll probably throw a camel ride in too! A fortnight's tour of Egypt's Western Desert, from Dakhla to Jebel Uweinat and the Gilf Kebir, then through the Great Sand Sea to Siwa. The classic tour of the Libyan Fezzan plus a visit to the Roman ruins of Leptis Magna and Sabratha, near Tripoli. The Western Desert tour of Egypt with a week or two to explore the ancient monuments along the Nile. 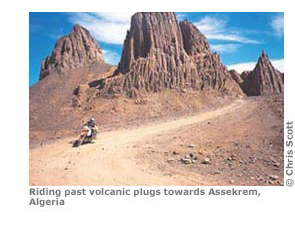 A springtime traverse of the Moroccan Sahara plus visits to the Imperial Cities. A fortnight or so in the Mauritanian Sahara (a lot of driving). Or ship your vehicle to Dakar or Banjul and fly in – less hectic but more expensive. Shipping to and from the above West African ports and exploring Senegal and Mali as far as Timbuktu. Some of the longer organised tours of the Aïr-Ténéné or Tibesti-Ennedi with a couple of days to spare either side. A relaxed tour of Tunisia and Libya without relentless daily driving. As above but continuing into Algeria from Ghat to Djanet, Tam and back to Tunis. An easy-paced visit down to Morocco and Mauritania, then shipping and flying back from Senegal or Gambia or selling your car locally (see p.461). Rather a rush, but a double crossing of the Sahara: down through Mauritania to Mali, Niger, Algeria and Tunis, or the reverse (logistically preferable). Any of the above as slowly as you like. Explore West Africa beyond Mauritania. Explore the Tibesti or Ténéné either by driving down through Libya and back through Algeria or shipping to Douala (for Chad) or say, Accra or Port Harcourt for Niger. Enjoy a full 10,000km tour of the Sahara from Tunisia, then Algeria or Libya, to Niger, Mali, Mauritania and Morocco, or vice versa. For a trip like this a couple of months would be more like it.